In 2014 Kalos officially came into fruition, but their history is deeper than meets the eye. Two members grew up together in a small town in Sweden, and two grew up in the Midwest, two met near the Arctic Circle and three serenaded a crowd at a house concert in Paris. All four have created unique and sustainable careers in the arts. 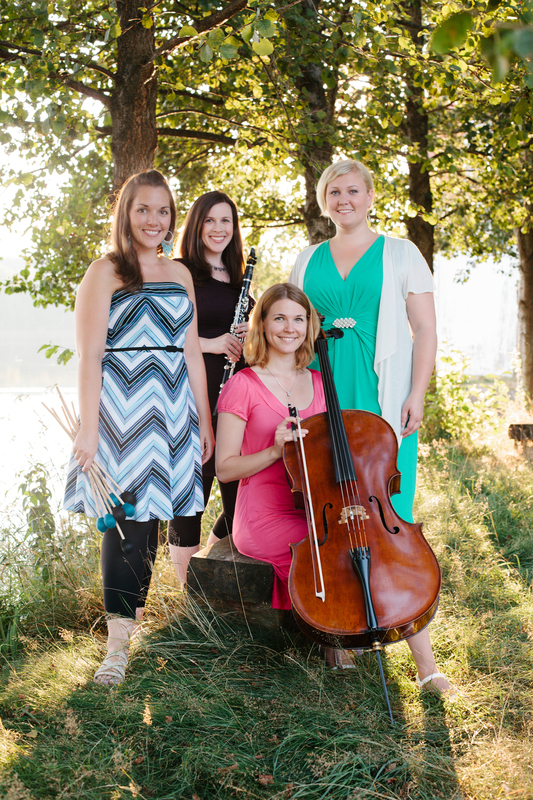 Maria Finkelmeier (percussion), Anna K. Larson (voice), Angela Shankar (clarinet), and Sanna Andersson (cello) created their first tour in 2014 as a quartet, combining their established duos “Clone Duo” and “En Vokalist och En Cellist”. The project consisted of four concerts at unlikely venues in Sweden celebrating music, food, community, and sustainable living. During the tour, they spoke to the n3 music school about the entrepreneurial spirit and management of a 21st century career in music. In 2015, the quartet was granted a residency at the Scandinavian Cultural Center in Newton, Massachusetts and collaborated with New York based poet, Kathleen Kraft to create two new works for the ensemble. Performances were held at the Scandinavian Center, Aeronaut Brewing Company, and a private home in New York City. In 2017, the ensemble was awarded a prestigious grant from the The Boston Foundation entitled "Live Arts Boston" to write, commission, and produce a new project. They were accepted into the Avaloch Farm Music Institute for a week residency, resulting in the premiere of four new works by Beau Kenyon (Boston), Seth Bedford (NYC), Gísli Jóhann Grétarsson (Oslo, Norway), and Kalos themselves, incorporating a combination of contemporary classical, folk, and musical theatre styles. The ensemble aims to bring a fresh voice to traditional folk songs, while self-composing and commissioning new works that highlight the unique nature of this instrument combination.